Martin Indyk is special assistant to the president and senior director for Near East and South Asian affairs at the National Security Council. Previously, he was the founding director of the Washington Institute for Near East Policy and published "To the Ends of the Earth": Sadat's Jerusalem Initiative in 1984. Daniel Pipes conducted this interview in the Old Executive Office Building on November 15, 1993. MEQ: There seems to have been a deep change in mood in the Middle East in recent years, both in the Arab-Israeli domain and in much of the region more generally. Any thoughts on the implications of such changes in the longer term? Martin Indyk: I've felt strongly since the end of the cold war, that the Iraq-Iran war, and the Gulf war, that there was a real opportunity to transform the Middle East. Circumstances had been created not just to achieve a real peace between Israel, the Palestinians, and its Arab neighbors but also to promote a very different vision that's been promoted by extremists there, whether they be secular or religious, over the last four to five decades. Our vision is of a peaceful, more democratic region focused on regional development. This is a new golden age for the region, where the potential that had been realized centuries ago can be realized again in cooperation with the West rather than against it. I really think that the region is ready for it and that a lot is now possible that wasn't possible a decade ago. MEQ: How has the September 13 breakthrough affected matters in this regard? Indyk: The breakthrough with the PLO was somewhat akin to the Berlin Wall coming down. I think it takes a little while for people to adjust. Some are able to do it more quickly than others. Let's talk about some of the things that are happening. The Egyptians are quickly dismantling the barriers that they had created to insure that the peace with Israel would a remain a "cold peace." You have the Gulf states moving, in their typical fashion, not trying to be too public about it, but in the case of the Qataris and the Omanis making clear that they are ready to meet with Israelis. They are ready to host Israelis in their countries within the framework of the multilateral working groups. The Moroccans and Tunisians are also now out front in dealing with the Israelis. This takes place in the context of the Syrians directly dealing with the Israelis in negotiations. Whey you have [PLO chairman] Yasir Arafat and [Israeli prime minister] Yitzhak Rabin shaking hands, it provides a cover for everybody else. There is one important caveat here: the extremists—particularly those promoted by Iran and the Sudanese and the rejectionist Palestinian groups—must not be allowed to succeed in their efforts to promote an alternative future that is a very destructive future, and that is no friend of peace. MEQ: Even with the caveat, it sounds like you're optimistic. Indyk: Oh, yes, very optimistic. MEQ: But the extremists are the potential fly in the ointment. Perhaps we can talk a bit more about the problems you see ahead. Indyk: Yes, absolutely. That's why you have to have a two-pronged approach. One promotes the peace process and gets behind the breakthroughs to achieve more breakthroughs; it makes sure that we take all sides by the hand and try to lead them to the promised land. The other makes very clear that the kind of behavior that Saddam Husayn or the Iranian regime engages in is unacceptable in this new Middle East. MEQ: Let's concentrate a bit on the Arab-Israeli peace process. The Syrian role since the Israeli-Palestinian breakthrough has been very ambiguous. President Hafiz al-Asad hasn't tried to wreck the process, as some feared, nor has he supported it, as some hoped. Asad has apparently not tipped his hand; do you have a sense where he's going? Indyk: I believe Asad has made a strategic decision to make peace with Israel. His actions indicate this. The words coming out of Damascus point to this. In his own way, Asad is preparing the Ba'th Party and the regional commands for a shift in policy. And he is preparing his people through justifications for peacemaking that came out in his interviews and statements of other Syrian leaders. You see a very interesting response from Asad since the agreement was struck between 'Arafat and Rabin. When [former Israeli prime minister] Shimon Peres went for the first time to Morocco in 1986, Asad actively discouraged the Moroccans; when they went ahead with visit, he withdrew his ambassador from Morocco for three years. This time, he simply didn't say a word. He even—admittedly after President Clinton called him—sent his ambassador in Washington to the September 13 signing ceremony, and this despite the fact that he was furious with Arafat and just could not believe that Arafat would have betrayed him like this. MEQ: He can't believe that he allowed Arafat to do it, and that Arafat got away with it. Indyk: Yes, and yet, he sent his ambassador to the signing ceremony to shake hands with Rabin and Arafat, and then to attend a luncheon afterwards with Peres and Abu Mazin [Mahmud Abbas]. Now, Asad hasn't said a word about the Jordanians since all this talk of a deal being done between [Jordan's] King Husayn with Peres and Rabin. Nor has he said a word of criticism against the Omanis and the Qataris for their meetings with Israelis. With respect to the Gulf states, Damascus is arguing that the boycott shouldn't be lifted until after there's a comprehensive peace. But the Syrians very quietly accepted that it was not a good idea to push the Arab League boycott meeting that was supposed to take place in October 1993, and that has now been indefinitely postponed. On the other hand, Asad plays up our role in his public pronouncements. He keeps saying: "The Israelis are not prepared to move, but the Americans are playing a very important toll. President Clinton is committed to the process." This is, I think, partly his way of justifying what he's doing; he's building a relationship with the United States. It was very clear from the beginning of the Madrid process that for Asad, the road to Washington led through Jerusalem, not the other way around. And he still sees it very much that way. He wants to build his relationship with the only superpower as part of his deal with Israel. I believe he has decided that he's going to make a deal with Israel. This is partly because he has no military option anymore, and partly because now he sees that all the others are going ahead without him. Lacking a military option, he doesn't have a very good way of stopping the others. The rejectionist groups in Damascus are not really capable of blocking the peace process; their ability to stop this deal is very limited. MEQ: Why then does Asad give these groups a free hand to make trouble? Indyk: The free hand he gives them, from all that we can tell, is not a free hand to conduct military operations. We are watching that very closely. He has said that he will not oppose the accord and not support it. He clearly will not pay a price for the sake of Arafat, who betrayed him. By this he means he is not prepared to constrain the groups, incarcerate them, or kick them out, because he claims that would create some problems within Syria, problems he could never really explain to us. MEQ: Then you don't see the ten Palestinian groups in Damascus that oppose the agreement as a serious force in themselves, and you don't see Asad backing them up with Syrian state power? Indyk: Not yet. But that doesn't mean that he doesn't retain the option. He does; that's the way he plays the game, just as he retains the option of using Hizbullah to create problems. At present he stops Hizbullah from operating against the towns in northern Israel, but the option remains. Asad's not doing anything to obstruct at the moment. You'll probably say, "Well that's not good enough," and I agree. But the more time passes and he doesn't use that option, the more time there is to consolidate the breakthrough between Israel and the PLO and to achieve progress with the Jordanians. If it's Asad's intention to block the peace process, time is not working in his favor. That's why I don't believe that he intends to do so. Rather, he wants assurances that his issues will be dealt with. Once reassured about that, I think he's ready to be neutral in his actions toward the Palestinian-Israeli track while rhetorically negative—at least for the time being. MEQ: Does the strategic decision to come to terms with Israel mean a peace treaty? Indyk: Yes, and all that that implies. We need to see Asad define specific terms of peace. It could be a Catch-22 as to who goes first, Syria or Israel. Asad must make it clear he is ready for a genuine end to the conflict—historic reconciliation with all that implies in terms of normalization of relations, open borders, and peace. And by peace, we mean peace like that between Canada and the United States. That's what we're telling Asad is necessary. Whether he's prepared to do it or not is something that we have to test. But I operate on the assumption that he is ready to do it. The challenge is to persuade Asad that to secure the deal that he's looking for, he must persuade the Israeli people he is genuinely committed to a historic resolution to the conflict, an end to the conflict with Israel. That's the challenge for American diplomacy. The interesting thing is that Asad wants us to play a role, partly because he wants the reward of a relationship with us, but also because he constantly harkens back to the days of Kissinger and shuttle diplomacy, insisting that the United States should be the broker, the guarantor. Remember, he believes a deal with Syria means the achievement of a comprehensive peace; everything else will follow because Syria sees itself as the beating heart of the Arab world. MEQ: Asad made a very interesting statement late in September 1993. In an interview with the MacNeil-Lehrer NewsHour, he noted that Shimon Peres went to the United Nations and said, "Why are you Arabs boycotting us? You have been saying the Palestine question is the core of the conflict. Here we are now, we have reached an agreement." To which Asad replied: "He is insulting the intelligence of the Arabs. Of course, we have said, and we still say, that the Palestine question is the core of the conflict, It is the core of the conflict in that it was the starting point of hostility. But as a result of the wars between Israel and its Arab neighbors, the core of the conflict that started in Palestine expanded to mean that every occupied Arab territory has become the core of the conflict." In effect Asad said he really doesn't care about the Palestinians. The veil may be off; for the first time in twenty-six years, Asad is now talking about the importance of his own occupied territory—the Golan Heights. Indyk: That's absolutely right. He feels the Palestinians have now taken control of their destiny. They made their bed and now have to lie in it. He's now relieved of responsibility to get something for the Palestinians. He has a free hand now, as do all the other Arab states. The Palestinians made their deal, and it's not just an interim deal because it's interlocked with the final settlement. The Syrians will admit to you there is an advantage in this. When all the pressure was on them to make a deal with Israel, they always had to worry, "What do we do about the Palestinians? In earlier interviews, Asad had actually said an interim deal would suffice, because the Palestinians had agreed to that in the Madrid rules. So they agree that the Declaration of Principles has lifted a burden off their shoulders. Now it's a question of territories, as he said in that interview, I think that's what he means. MEQ: In terms of Syria building a relationship with the United States, does Lebanon count? Some thirty to forty thousand Syrian soldiers are there, controlling the country. Are we concerned about that? Indyk: We are interested in seeing the government of Lebanon sovereign over all its territory. We want to see this occur within the context of a peace treaty between Israel and Lebanon. It is not a problem to get a withdrawal of Israeli troops; the Israelis have said they are ready to do so. Similarly, we would like to see Syrian troops withdrawn from Lebanon. Realistically, I think it's only going to come in the larger context of a Syrian-Israeli deal. MEQ: So you can't expect anything to happen in Lebanon before Syria and Israel really get down to talking. Indyk: I think a Syrian troop withdrawal will take place only in the context of peace agreements, and we are going to have to work out arrangements. In the first place, if there is to be an Israeli-Lebanese agreement, Hizbullah has to be shut down in southern Lebanon. Otherwise, there is no way in which the Israelis are going to leave the security zone. The Lebanese army has the capability to shut down Hizbullah, but Syrian backing is very important. If that can be achieved, if a peace between Israel and Syria can be achieved, we can then also achieve the third objective of a Lebanese government sovereign in its entire territory. MEQ: News reports suggest that Prime Minister Rabin's current [November 1993] visit to Washington is leading to renewed promises of U.S. aid to Israel. But a growing body of opinion, both in the United States and Israel, hold that this aid, maintained decade in and decade out, is not really good for either side over the long term, whether for political, economic, philosophical, or even moral reasons. Do you agree that it is in the long-term interests of both parties to end the aid relationship? Indyk: The commitment that President Clinton has made is a commitment made in the context of the risks that the Israeli government is undertaking for peace. The risks it is taking, as well as the potential risks, may palpably reduce its security. Since the president is committed to minimizing these risks, it's important that we maintain our aid levels for Israel. I can envisage a time when Israel won't need external help, when it will not have to depend on aid relationships. Hopefully, in the not too distant future, the benefits of peace will be both regional and international, and Israel will be an active participant that will broaden its horizons, leading to a greater level of prosperity that will sustain it on its own. That's one reason why we are so committed to ending the Arab boycott. That's one reason why we are promoting the multilateral negotiations, because they provide a basis for regional economic development. Should economic development take place, the aid question will become no longer relevant. But, at this moment, it would be a big mistake to get caught up in the argument that Israel needs to be independent and stand entirely on its own two feet, because one has to take into account the particular circumstances. The circumstances are such that Israel is taking on a burden that has economic consequences, such as the redeployment of troops from Gaza-Jericho and eventually the whole of the West Bank. The Israelis have not come to us and said, "Give us another $300 million dollars, please, to pay for that." They have said they would appreciate our enabling them to use the loan guarantees for that purpose. When we get to other agreements—Israel with Syria, Lebanon, and Jordan—other burdens will arise, and I think we're going to have to face these in the near future. So the theory is correct—in fact, I was an advocate of Israel weaning itself off American aid before I came into the government. But that was also before the breakthrough in the peace process. MEQ: Turning to the Persian Gulf, I recall that in May 1993, you articulated the policy of "dual containment" toward Iraq and Iran. Is it accepted by all in the U.S. government? Are you satisfied that it is in effect? Is it working? Indyk: Yes. There was a lot of speculation generated, I think, by the Iranians because when my colleague [Assistant Secretary of State] Edward Djerejian went to Capital Hill and talked about our policy toward Iraq and Iran, he didn't use the words "dual containment"; therefore, some assumed that a change of policy had occurred. But if you check Ed's explanation of our policy towards Iraq and Iran, you'll see an exact correlation with my own—due to the simple fact that we coordinate these statements. People like to say "Indyk's speech wasn't cleared." I can tell you definitively—here's a scoop for you—that it was cleared. It is the policy of the president of the United States. We have a policy of enhanced containment of Iraq and active containment of Iran. That's what the policy is: dual containment. Now, there is an important distinction between policy towards Iraq and policy towards Iran. We have no problem with the Iranian government per se, but with five specific mistakes in its foreign and security policy behavior. Its promotion of assassination and terrorism on a worldwide scale. Plus, of course, we take into account its horrible human rights record. We want to see a change across the board. We want the Iranians to understand that they cannot have a normal relationship with the West at the same time as they engage in policies designed to threaten and undermine Western interests. MEQ: What about the Germans? They have taken several steps that seem to be out of line with our own thinking. They invite the Iranian chief of intelligence to Germany. They appear to be selling all sorts of weapons to the Iranians. They rescheduled the Iranian debt. Are we getting our message across to them? Indyk: Well, we are trying. We were particularly upset by their hosting the head of the Iranian intelligence, and we also made that very clear. At present, however, we don't believe the Germans are supplying Iran with weapons. Nor have they rescheduled yet, and we have made very clear our strong opposition to rescheduling. That puts us up against the banking interests there, so ours is a difficult proposition. Regardless of the merits of our desire to promote a common good, the bankers might think otherwise. That's the way banks are. Look at what happened to the Latin American debt. So we're up against a kind of bank interest as well as a political interest. Nevertheless, we point out that Iran's nonconformance in paying back loans makes it a bad economic proposition to lend it more money. Given the Iranian government's economic performance, it doesn't make economic sense, let alone political sense, to throw good money after bad. That's the argument we make, and we will continue to press it. There is certainly no lack of resolve on our part. The Germans understand very well the differences we have with them on this issue. More generally, we have a disagreement on the best way to deal with Iran. We are not against talking to Iran. But we are against building a normal relationship with Iran while it continues to act in a way that threatens our interests. Iran's behavior towards the breakthrough in the peace process just underscores for us what we've been saying all along. The Iranians are the only ones, except for the Libyans, actively opposing the Israel-PLO accord. There is no rejectionist front in the whole world except for the Iranians and the few Islamist and Palestinian groups they support. The vitriol, the threats, and the language—"destruction of the Zionist entity"—are things we haven't heard in years. They represent a throwback to the 1960s. This is clear evidence of the problem we have. Here you have the Europeans getting behind the Israel-PLO agreement, putting up serious money to make sure that it succeeds, and at the same time they do business with the same Iranians who are doing their best to make sure the agreement does not succeed. That's the kind of contradiction in policy that we try to point out to the Europeans; it just doesn't make sense. I think that it will continue to be an uphill struggle with the Europeans. We have a dialogue with them about Iran, a structured dialogue. They are very much aware of our concerns in this regard and I hope over time we will succeed to convince them as it becomes ever more evident that we are right about the policies the Iranians are pursuing. In the meantime, though, the Iranians are not doing that well. Yes, they have the ability to interfere where the problems already exist, whether it be in Somalia or Sudan or Algeria or Egypt or Lebanon. But it's a low-cost way of taking advantage of opportunities. MEQ: What about Iraq? Anything to report there? Indyk: In the case of Iraq, we see that the containment policy is working. The Iraqis are now moving towards us in terms of partial compliance. I would underline partial because it is far from full compliance—it's only partial compliance with the U.N. resolutions on weapons of mass destruction. It's very interesting that since the bombing of the intelligence headquarters in Baghdad [on June 26, 1993], which punished Saddam Husayn for his efforts to assassinate President Bush, Husayn's behavior has shown some improvement. During our first six months, you may remember, he was constantly challenging us in the skies over the "no-fly zones." Every week some kind of incident took place. He is not doing that for the time being. We used to be very concerned that Saddam seemed ready to move into northern Iraq against the Kurds, and we were constantly on alert for that. Of course, he could turn the threat on again very quickly. On the other hand, Saddam has been engaged in a systematic campaign against the marsh Arabs, which is particularly disturbing. We now have some reports, as yet unconfirmed but which we're checking out, that he's actually used chemical weapons. So, I don't want to suggest that he is anywhere near the full compliance that we insist upon. Nor do we expect Saddam ever to fully comply with 687 and 688, because he could not stay in power if he did. My point is different: he's no longer a threat to his neighborhood, and we have to keep it that way. He remains a threat to his own people. That's one reason we're still concerned with him. But, that is much harder to deal with. Indyk: Yes. He could come out after it. He's rebuilding the army, training it, and putting it through its paces by holding major military exercises in the south. He could move in at any time. But, when it comes to Kuwait, I don't doubt that we have the ability to respond. It would be a disastrous mistake for Saddam; he knows that. That's why we remain very active in the wake of the Gulf war. The Clinton administration continues to ensure that we have the ability to deal with Iraqi forces if Saddam becomes a threat again to his neighbors. The price of Saddam's survival is eternal vigilance. Hopefully, things will change in Iraq. But, until they do, we're just going to have to be ready for anything. MEQ: When things do change, a crisis will most likely result. It's hard to imagine Iraq going from today's dictatorship to a more normal kind of regime without violence and trouble. Are we ready? Indyk: I don't think that there is a lot that we can do to make sure that a stable transition occurs; we just don't have those kinds of capabilities. More generally, it's very hard to predict when or whether change will happen. And then it's very hard to predict what will happen. We could work out all sorts of scenarios, but when you're dealing with an internal struggle for power we cannot determine the outcome. Our policy is to maintain the territorial integrity of Iraq. Change in Iraq is a problem, but not a problem that can't be handled. It really depends on how it happens. It would certainly be preferable to the current state of affairs. Indyk: By the way, I was just talking about Kenneth Beatty, the American citizen taken prisoner in Iraq. He was released today; he'll be back tomorrow. It's another indication that Iraqis are trying to put on the charm. They're also putting out feelers, saying they're ready to make peace with Israel, and some Palestinians friendly to Baghdad are busy making a contribution as intermediaries. We remain uncharmed. MEQ: Speaking of not being charmed, if I understand the U.N. resolutions correctly, number 687 allows the Iraqis to sell unlimited quantities of oil on the condition that they destroy their weapons of mass destruction. That resolution was passed in April 1991. Are we still today prepared to permit those exports? Is strict adherence to Resolution 687 enough, or do we have political conditions as well? Indyk: We want to see full compliance with all the U.N. resolutions. The sanctions are a very effective means of trying to induce full compliance with all these resolutions. Paragraph 22 of Resolution 687 provides that when Iraq has complied with all of the requirements that the United Nations has set in terms of weapons of mass destruction, then the sanctions on oil exports will be lifted. We will need to see full Iraqi compliance with regard to eliminating all weapons of mass destruction, and also with regard to U.N. Resolution 715, which provides for long-term monitoring of Iraq's capability to produce weapons of mass destruction. UNSCOM [the United Nations Special Commission] demands that there be a system in place—up and running for a period of time, as well as full compliance with the United Nations inspection forces—before it will inform the U.N. Security Council that the Iraqis have complied. At that point, we would have to decide whether they have satisfied all the criteria for compliance. MEQ: In other words, the U.S. government has a broad understanding of Resolution 687 and you will assess the whole political situation before permitting changes. So, there's no automatic permission for Baghdad to sell oil. Indyk: Right, not at all. The Security Council has to decide about that. And while Saddam Husayn is moving towards partial compliance, that's not full compliance. And full compliance is so hypothetical that I can't tell where the United States would come down. MEQ: If we could turn to foreign policy in general, by general consensus this is not the strong suit of the Clinton administration. In part that's due to the many new problems arising: Somalia, Bosnia, Haiti—the terrible trio. The Middle East seems to stand out as an area of success, small and great. Any thoughts on how well things are going in the Middle East, especially compared to elsewhere? Is it the quality of the people involved? (Laughter.) Is it the fact that we have an already established approach and so you don't have to rethink policies? Indyk: As the president has said, this administration's got the big things right. It's the small things that grow much more complicated and difficult to deal with. On the matter of personnel, note that the same people who deal with the Middle East deal with other issues. The president has been actively engaged, and Secretary of State Warren Christopher deserves credit for the things he has done to keep the Middle East peace process on track. Take Lebanon, for example, with respect to what he did to end the military operations there [in July 1993]. He dealt with the issue very effectively, yet people forget this. He did it, very importantly, by working with Israel, not against it. The main achievement was in developing a relationship of trust with Prime Minister Rabin, and on that basis he worked out a solution. So, too, I think that if a breakthrough with the Jordanians is sustainable, it would be in a large part due to the fact that the president decided to invite Crown Prince Hasan of Jordan and the foreign minister of Israel to meet with him in the Oval Office and lay the foundation for a breakthrough. It's true that the Clinton administration inherited both the circumstances, in terms of the end of the cold war and the results of the Gulf war that made these breakthroughs possible. It's true that we inherited a negotiation that [former] Secretary of State [James] Baker had put together in Madrid, but also laid the basis for the breakthroughs. And so, in a sense, the time was right for those achievements. But there was also a commitment on our part. The day after the president was elected, he said that he was going to make it a priority to continue the peace process so as to assure continuity in the American commitment. The challenge is to turn continuity into a comprehensive breakthrough to peace. That is our objective. I think that it's partly circumstances, but it's also partly the approach of this administration, which was to get behind Rabin. He told us he was prepared to take risks; we replied that to make it possible for him to take those risks we had to minimize those risks. He and the Israeli people had to feel secure in their relationship with the new administration, that they could trust President Clinton and Secretary Christopher, that they did not see working with Israel and the Arabs as a zero sum game. It was important for us to demonstrate that we could have a relationship of trust with both sides, and not just with King Husayn, but with Hafiz al-Asad as well. MEQ: You've made a personal transition from analyst to actor. Has your thinking about policy formulation and implementation changed by virtue of your experiences during the past year? Indyk: Two thoughts. First, I had expected much greater contentiousness. I had expected the walls to rise, to be isolated, to have to push against prevailing assumptions, and to have a very hard time establishing cooperative working relationships. I was very pleasantly surprised to find the going easier than I had expected. I get on very well with my counterparts at the State Department, who are of a like mind. We agree on policies both in terms of what we are doing in the Persian Gulf against Iraq and Iran and what we are doing in the peace process. We work very well as a team and we have a lot of access to our bosses, National Security Adviser Anthony Lake and Secretary Christopher, and of course the president, all of whom are engaged in the subject. There is very little bureaucratic committee work involved. The Middle East group is a little different, particularly in the peace process, because it's so focused on diplomacy that there isn't a big role for other agencies. As a result, only a small team works on this. It's done in an informal way, which works very well. That's been a pleasure. Secondly, it's very easy—I'm surprised at how easy—to be cut off from the outside just because of the sheer pressure of the work, the voluminous amounts of material that come across your desk every day that you can't possibly hope to read. You find yourself isolated from the people you used to deal with, and also cut off from the kind of information that they and the rest of the world deal with. Instead, you deal with this very rarefied information. If you don't make a conscious effort to read the press—the Middle Eastern as well as the American—you very rapidly lose perspective. MEQ: It comes with the governmental environment, does it not? Indyk: Right. You really need to have an exchange with experts from outside the government who are looking at the same phenomena but from a different perspective. You really need to be reading what outsiders are writing, not just what is coming across your desk. But it's hard to do. It's very true that you run down your intellectual capital. You don't have time to build it up. You begin to lose perspective. So I think it's very important not to do this job for too long. "THE MOST AMAZING DAY OF MY LIFE"
MEQ: Finally, any vignettes? You've been traveling a lot and seeing many people. Anything you want to tell us? Indyk: I've got piles of vignettes. MEQ: Anything that you can recount? Indyk: Well, my encounter with Arafat. I never imagined on taking this job that I would welcome Yasir Arafat to the White House and help organize the reception for him. MEQ: I saw you on September 13. You seemed quite elated. Indyk: Well, it was quite an exciting time, an amazing time—indeed, the most amazing day of my life. There was this amazing moment ten minutes before Arafat was supposed to arrive. 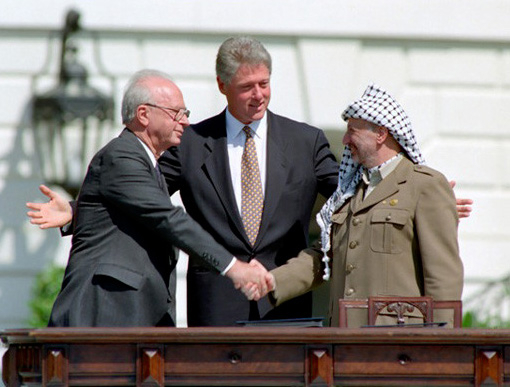 Arafat was supposed to arrive at the White House first, with Rabin following a few minutes later. Dennis Ross and I were standing outside the Oval Office, waiting to enter and brief President Clinton, President Bush, and President Carter, who were later to go over to the Blue Room to meet Arafat and Rabin. Dennis and I were on separate telephones shouting—Dennis and I were on separate telephones shouting—Dennis at the Palestinians and myself at the Israelis—because both were threatening not to come. The Israelis got wind that Arafat was wearing a uniform and said that was unacceptable. The Palestinians were upset because the text of the agreement did not mention the PLO, only "the Palestinian Delegation." So, ten minutes beforehand, the Palestinians insisted that the Israelis agree to a change in the text; and the Israelis insisted on a change in Arafat's clothing. There we were, the two of us standing there shouting at these guys over the phone, telling them not to throw it all away. I think the thought was running through both of our minds—that the whole thing was going to fall apart at the last moment with thousands of people waiting outside, and I was going to be blamed. So we tried to find out what Arafat was wearing. Somebody with him told us he was wearing a safari suit. I passed that on, explaining to the Israelis that Arafat really wasn't wearing a uniform, he was wearing a safari suit. MEQ: Did you see the label? Banana Republic? Indyk: No, no. (Laughter). It was pretty much a uniform, actually. In the end, of course, they all turned up. I think they all probably intended to turn up, and this was just a sign of last-minute nervousness on their part. But it took a few years off both of our lives. Related Topics: Arab-Israel conflict & diplomacy, US policy | March 1994 MEQ receive the latest by email: subscribe to the free mef mailing list This text may be reposted or forwarded so long as it is presented as an integral whole with complete and accurate information provided about its author, date, place of publication, and original URL.